Annalise spent the day on the floor of the Maine Senate. AUGUSTA — Readfield Elementary School student Annalise Roderick served as an honorary page on April 20 in the Maine Senate. Annalise was the guest of Sen. Shenna Bellows, D-Manchester. 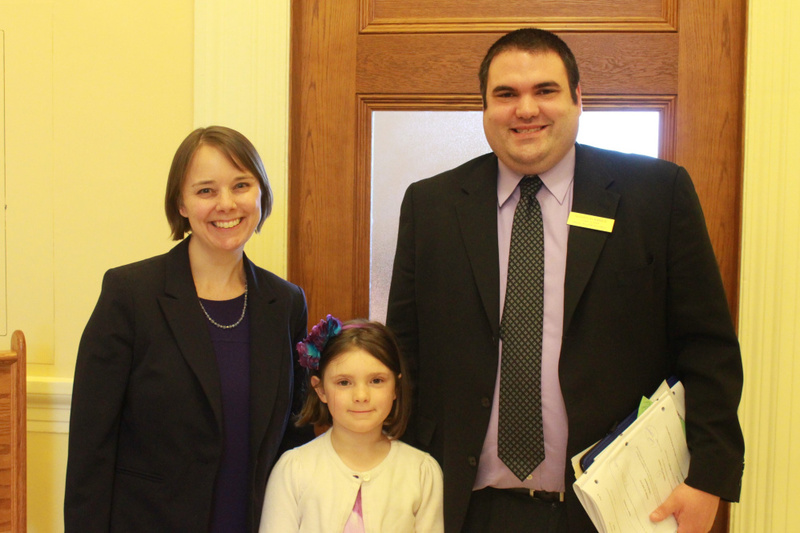 Annalise took a picture with Bellows and her father, Shawn Roderick, during a break in the Senate Session. Roderick serves as Chief of Staff for the Senate Republican Majority Office. The Honorary Page program gives students an opportunity to participate in the Senate and interact with legislators. Honorary pages see what it is like to work on the floor of the Senate and be part of a legislative session. Pages perform such duties as delivering messages to senators and distributing amendments and supplements in the chamber. Students from third grade through high school are invited to serve in the Senate Chamber as Honorary Pages when the Senate is in session. For more information or to schedule a visit, call Bellows at 287-1515.